DALLAS — Police say a "ranting" man accused of crashing a pickup truck into a Fox affiliate television station building during a live newscast is not believed to have been targeting the media. 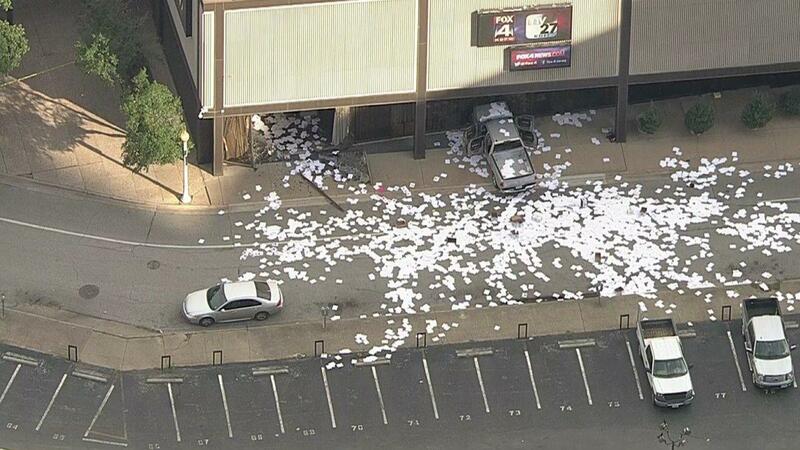 The crash occurred outside the offices of Fox 4 News station KDFW-TV in downtown Dallas shortly after 6 a.m. Wednesday. Photos show the front of the vehicle rammed into windows near an entrance. Dallas Police identified the suspect as Michael Fry, 34. Court records show he has a lengthy criminal past, with arrests on nearly a dozen charges in Denton County, including assault, criminal trespass and driving while intoxicated. Michael Fry's mugshot. Dallas Police Dept. The man paced and scattered numerous handwritten papers outside. Officers said Fry was "talking and rambling, but did not make any sense." He was not able to enter the building and was soon arrested. Senior Cpl. Debra Webb said Fry was taken to a hospital for examination after the incident. No one else was injured. "It does not appear the suspect was directly targeting the media in this incident," Webb said. Dallas Police Major Max Geron said Fry had "mental issues" and had indicated to them that "people were trying to kill him," CBS Dallas/Fort Worth reports. Fry was apparently upset about a deputy-involved shooting in Denton County in 2012. During that incident deputies shot and killed a driver that rammed a squad car. Fry was a passenger in the suspect car. KDFW-TV anchor and reporter Brandon Todd, who witnessed Fry pacing outside the station before he was arrested, said the man was yelling about "high treason," and that he believed he had clearly been wronged and that someone was trying to kill him. Huge windows could be seen shattered and broken completely out as the truck sat against the glass, with the front end crumpled. Dallas police went to the scene at the corner of Griffin Street and San Jacinto and later called in members of the bomb squad, CBS DFW. Police said no explosives were found. "When he [suspect] did come out of his vehicle, after ramming the building, he pulled a bag out of his vehicle so we had our EOD, our bomb unit, come out here just as a precaution to check that and make sure that it wasn't anything dangerous," Webb, the police spokeswoman said. "The bag was cleared."